German physician Hermann von Helmholtz (1821-1894) demonstrated in his 1863 book On the Sensations of Tone as a Physiological Basis for the Theory of Music, that a single sound is the addition of various sound frequencies in addition to the basic pitch. Helmholtz completed the demonstration using his famous Resonators, brass spherical bottles with holes at both ends, in which one can hear the basic pitch of any given sound, however complex. The technology of the time did not allow Helmholtz to go further and create unheard sounds from scratch, but that would have been the next step. Like Helmholtz, Herbert Eimert (1897-1972) believed in a scientific approach to sound production. 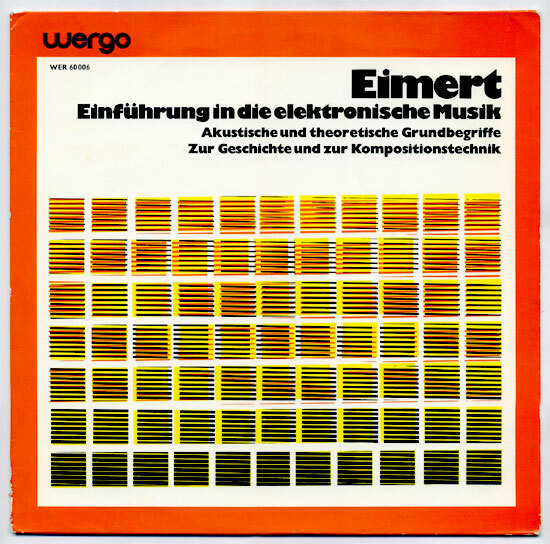 When, around 1950, phonetician Werner Meyer-Eppler and sound engineer Robert Beyer convinced Eimert of the feasibility to produce any kind of sound waves through (first the Bode melochord, and later) oscillators, Eimert envisioned a dedicated studio facility providing German musicians with a means for implementing the total serialization of music, the logical conclusion of his hero Arnold Schönberg’s 12-tone technique. 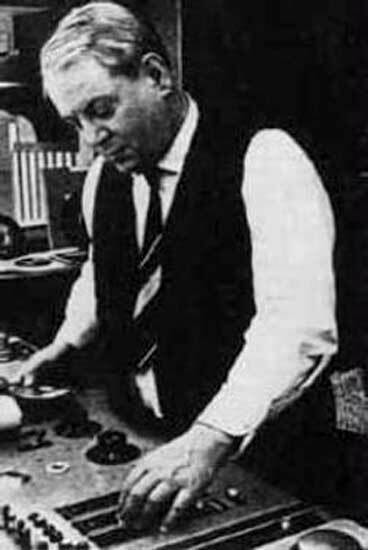 Eimert, whose devotion to Schönberg was total and unconditional, was only twenty-seven years old when he published his theoretical book Atonale Musiklehre, or Atonal Music Theory (Leipzig, 1924) summing up the innovations of Schönberg’s 12-tone music. 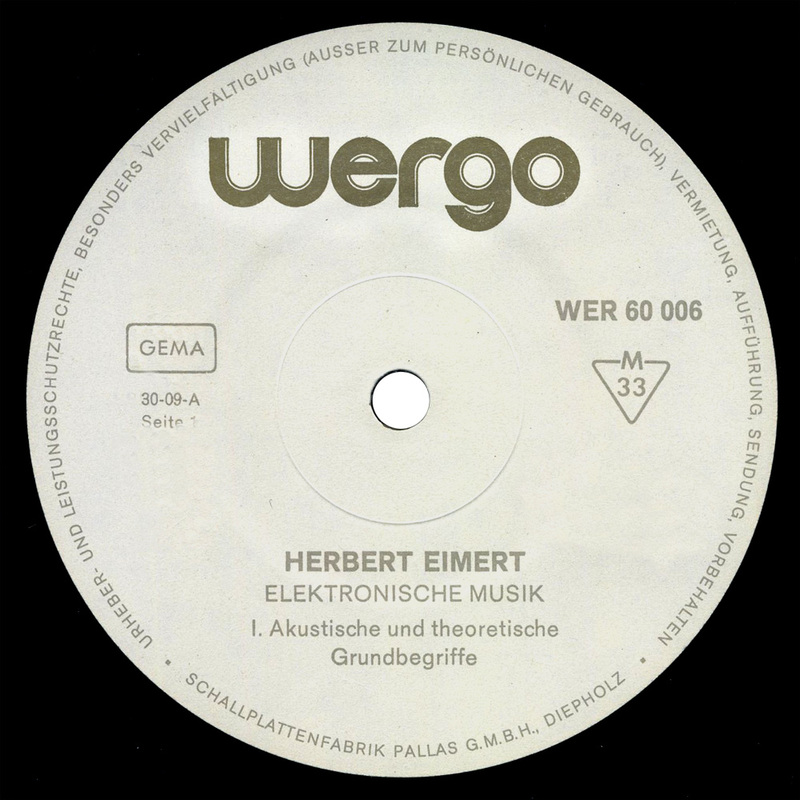 Eimert had been working as music critic for the Kölnischen Zeitung journal from 1936 to 1945, after which he worked as music editor for Köln (aka Cologne) radio NWDR (Nordwestdeutscher Rundfunk, now Westdeutscher Rundfunk), then under British administration. As director of the NWDR’s late-night music programs since 1948, he launched his own broadcast series, Die Klangwelt der elektronische Musik (The sound world of Electronic Music). 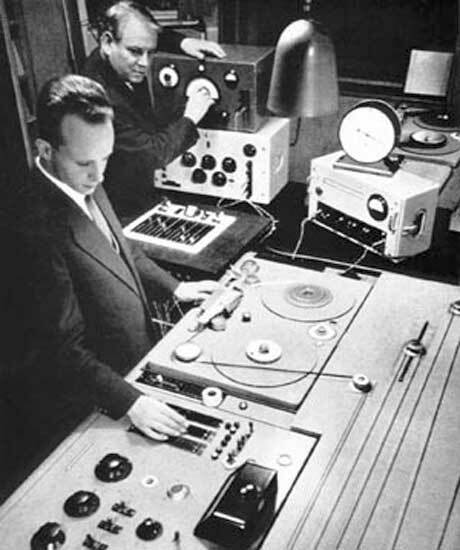 The first show, aired October 18, 1951, had lectures by Eimert, Beyer and Friedrich Trautwein on his Trautonium, plus sound examples freshly recorded on AEG Magnetophon tape recorders in the specially equipped studio granted by the radio for the realization of the Elektronische Musik, and that was to become the famous Köln electronic music studio. Stockhausen joined 1953, Gottfried Michael Koening in 1954. The first commercially released LPs appeared on Wergo in 1954. ♫ Like any other electronic/electroacoustic studio, the Köln studio had been subject to internal debates and theoretical divides during its first decade: Gottfried Michael Koening and Stockhausen did not get along well ; Robert Beyer had a rather different conception of electronic music than Eimert, the former dreaming of “floating sounds”, says Konrad Boehmer ; many composers visited the studio (Pousseur, Kagel, Ernest Krenek, Herbert Brün, etc), bringing new ideas with them and in a way diluting the original concept ; the music magazine Eimert founded, Die Reihe, 1955-1962, was not well received in the UK and US, too pretentious for some critics. Understandably, Eimert felt the need to sum up what he believed was his discovery in Einführung in die Eletronische Musik, or Introduction to Electronic Music, published by Wergo in 1963. Einführung… is a Hörbeispiele (or radioplay with sound examples) of electronic sounds and various ways to combine them, starting with basic elements like sine wave, pitch, tone mix, noise, chord, pulsation, envelope, and then moving to serial music, composing with electronic sounds, etc. The B-side is devoted to music examples from Webern, Meyer-Eppler, Eimert, etc, plus electronic versions of Stravinski’s music (!). A partial transcription of the text can be found here (in German). 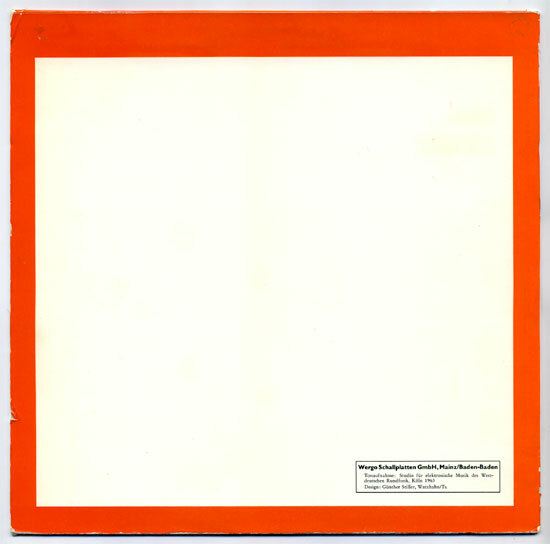 The LP comes with 8-page booklet with liner notes by Helmut Kirchmeyer. This post is a collaboration with Acousmata, who offered to digitize the LP, while I scanned cover+booklet from my own copy. Thanks for the nice comment. This kind of radical pioneers deserve our admiration, I agree with you. More often than not, they were laughed at in their lifetime. stumbled upon your blog this evening. looks like a treasure trove of unheralded gems. i’ll be sure to learn and enjoy so much that you’ve provided here! Hi, David. Glad you found things to enjoy on this blog. I’ll try some of your own mixes very soon! Thanks for dropping by. Hi. I can’t open any Multiupload site in my computer. It’s not because I exceded the free download limits or anything, the links simply don’t work. Can, please, anybody send me a link to this great record in another site like Rapidshare, Mediafire etc? It’s really important to me, because I spended almost my entire life looking for this album, since the previous, ‘Epitaph Fur Aikichi Kuboyama’s amongst my all-time favorites. Hi, Bernardo. Would be glad to oblige. Try any of the following links to download: zshare, hotfile or deposit. If none works, I’ll make a new upload for you on your favorite d/l sites. Thank you, Continuo, I really aprecciate it. I’m currently downloading the album from Hotfile. Thank you again for having such a great blog and posting this fantastic Musique Concrete pearl. I hope this is as good as ‘Epitaph Fur Aikichi Kuboyama’. This is a Hörbeispiele, Bernardo, a guide to composing with electronic sounds. The sound quality and sound examples are wonderful, but perhaps not as uplifting as Epitaph. Hope you enjoy, anyway. You’re welcome, g, as well as «anonymous» above. Possibly, sto, but on this blog we don’t let language barriers deter us from exploring other countries’ music output. Excellent, for the first time I’ve been able to compare Webern’s Op30 to its electronic variations. Hi, Veryan. Thanks for the offer. I’ll get in touch with you back channel. Thanks for this brilliant post! I would like to quote some your article for a master thesis that I am writing currently in Holland. Would it be possible to have your name? Sorry, I don’t disclose my actual name to visitors. You can quote freely from this blog for your thesis and credit it to “blogger Continuo”, if you want. Hello continuo….I am not able to download this album as I have a Mac. Any chance at all this could be made available some other way? mp3? I’m an electronic music composer and would really love to hear the whole album. Thank you! Hi continuo, I’m also interested in a re-upload to another hoster as none of the links above work anymore… anyway, great to see that people are still interested in the beginnings of German electronic music.